Tag Archive | "Larry Shue"
Cast names (in photo) are: seated: RJ Moore, Anna Ambrose, Tom Johnson. Standing l-r: Rod Zamarron, Mark Stoll, Deb Irwin, Doug Christensen, Laura Johnson. 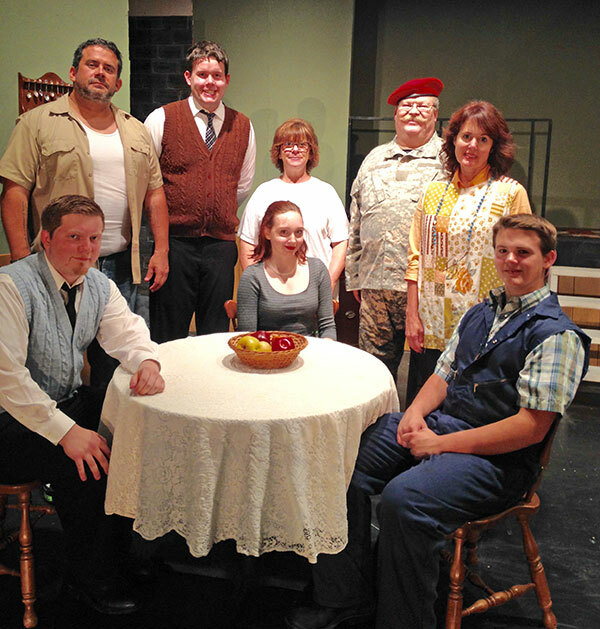 The comedy “The Foreigner,” by Larry Shue, will be presented by the Cedar Springs Community Players at the Kent Theatre on Oct 13, Oct 14, Oct. 15, 2016. The show, directed by Sue Harrison, will start at 7:30 p.m. each night. The show was one of Jack Clark’s favorite shows and is being dedicated to him. Pre-sale tickets are available at the Cedar Springs Library or from any cast member for $10. Tickets at the door are $12 for adults and $8 for students under 18. Rehearsals are underway for the Cedar Springs Community Players fall comedy, The Foreigner by Larry Shue. Blocking is completed and actors are working on learning lines and creating a believable character role. This is the 76th show by the Cedar Springs Community Players in the 45 years of producing plays and musicals in the community. The Foreigner, by Larry Shue, is directed by Sue Harrison, with Nancy Noreen as Production Coordinator, Charlene Sommer as Stage Manager, and Deb Irwin working with props. Many of the cast members have worked with the Players before or with other community theatre groups. The cast includes: Doug Christensen as “Froggy” LeSueur, a British officer; R.J.Moore as Charlie Baker, a pathologically shy British proof-reader; Laura Johnson as Betty Meeks, widow and owner of the resort; Mark Stoll as Rev David M. Lee; Anna Ambrose is Catherine Simms, a former debutante engaged to Rev. Lee; Rod Zamarron as Owen Musser, a backwoods scoundrel with tattoos; and Tom Johnson as Ellard Simms, a backward boy who is Catherine’s brother. The comedy takes place in Betty Meek’s Fishing Lodge Resort in Tilghman County, Georgia. Mostly middle-income people come to this laid back, off-the-beaten- track resort to fish, swim, play a little cards and fill up on Betty’s down-home cooking. Now insert into the mix, Charlie, a foreigner and shy proofreader who is brought to the resort from England by his friend, “Froggy”. Charlie wants nothing more than to be left alone and is fearful of making conversation with strangers. So “Froggy” tells the others that Charlie is a foreigner and speaks no English. The fun really begins when Charlie overhears more than he should and things get complicated. The show has one comic surprise after another and the “good guys” emerge triumphant! Even though The Foreigner takes place in the recent past, the Golden Rule in dealing with people, even though they are “foreigners” is as relevant as it always has been. The Foreigner will be presented at the Kent Theater on Thursday, Friday, Saturday, October 13, 14, and 15, 2016 at 7:30 p.m. Tickets are $10 pre-sale and $12 at the door.